Congratulations to Mike Tomczak on winning our sixty seventh High Five Giveaway and thank you to all who entered! 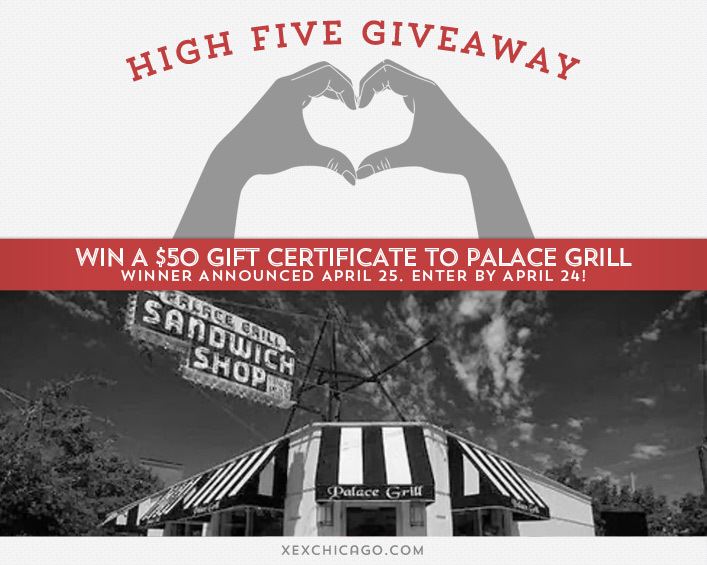 Our next giveaway is for a $50 gift certificate to Palace Grill. Other than XEX, what is your favorite local Chicago independent store, service provider or restaurant? Now, just add a comment to this post with the right answer to be eligible to win! The winner will be announced on Friday, April 25. Entries must be received by midnight on Thursday, April 24. Anna’s Asian Bistro on Lake St.
Big Star all the way! I like Knee Deep Vintage in Pilsen… Great clothes and a fun little selection of vinyl records too! Babylon, a Middle Eastern restaurant that used to be in Bucktown! Antique and vintage china, dinnerware, silver, hotel and cruise ship accessories, travel items and much more.